The ‘War on Women” became a seminal issue of the 2012 United States presidential election. Never before had women’s issues been at the forefront of a political contest in which many men openly revealed their utter ignorance of how women’s bodies functioned, while waging an all-out campaign to eliminate the legal statutes that guaranteed the right for women to seek and secure safe abortions. While Americans were discussing abortion rights in the abstract, last month an Indian woman living in Ireland, Savita Halappanavar, 31, died because she was not allowed to receive an abortion. Her tragic story began when she presented to University Hospital Galway because at 17 weeks pregnant she was experiencing unusual back pain. By all accounts Mr. and Mrs. Halappanavar were happy with the upcoming addition of a child to their family, so this sudden development was worrisome. Savita, a dentist, and her husband, an engineer, waited for the results of her internal examination, but when the doctor returned with the prognosis it was devastating. She was fully dilated, her amniotic fluid was leaking, and the child would not survive. Doctors told her that she would miscarry in a few hours, but instead according to a report in the Irish Times today, she “died of septicemia a week later because, even after doctors confirmed that her baby would certainly die, they refused to perform a life-saving termination of the pregnancy citing the fact that Ireland is a Catholic country. This is a clear case of when the religious beliefs of attending physicians outweighed their Hippocratic Oath. Though, the Halappanavar repeatedly begged the doctors to induce labor since it was clear that the fetus would not survive, but each time doctors refused to perform the life-saving measures required to save Savita’s life, asserting that as long as there was a fetal heartbeat they would not terminate the pregnancy. Over the next few days medical personnel seemed to take inordinate care of the fetus, checking every few hours to see determine if its heart was still beating. Meanwhile, Mr. Halapannavar had to watch Savita deteriorate as poisonous blood course through her body. Once it was clear that they could not save her baby, Mrs. Halappanavar once again begged for the doctors to induce labor to end the pregnancy, as before, these requests by all accounts were assiduously ignored. Mr. and Mrs. Halappanavar are Hindu and thus believed that they were not subject to the prohibition against abortions which governs the religious lives of Irish Catholics. Even when Mr. Halappanavar explained that they were neither Catholic nor Irish and that under the Irish law, a woman has a “legal right to an abortion where there is a ‘real and substantial’ risk to her life,” the doctors still refused to save her life. Two months prior to Savita’s death, on 13 September 2012, more than 140 Irish medical professionals from the fields of obstetrics and gynecology, mental health, and molecular epidemiology attended a symposium to discuss abortion as a tool to save a mother who has a problematic pregnancy that is life-threatening. Thus, Savita perished after a week of suffering and with the knowledge that she had already lost her child and that she would most certainly die. 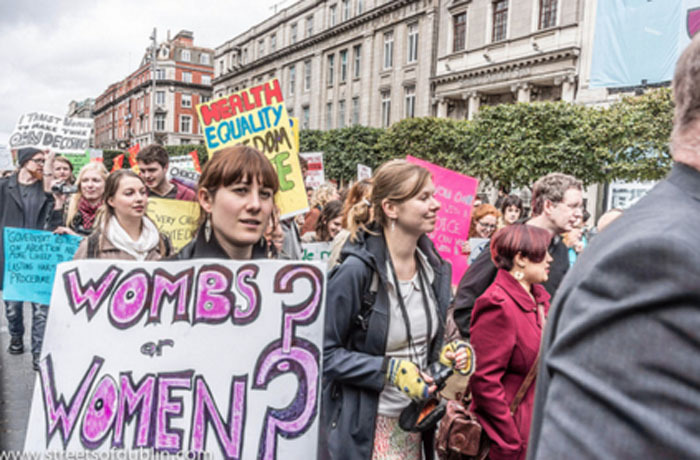 Meanwhile, across the pond, America pro-choice supporters mounted a vigorous defense of Roe vs. Wade while combating ignorant beliefs about pregnancy espoused by many far-right conservatives like former Representative Joe Walsh. When women’s freedom and the right to self-determination is held hostage by religious beliefs, cultural bias, or patriarchal dominance, death is sure to follow. Whether by stoning or honor killings or medical neglect, the net result is women everywhere remain at risk as long as a few people can impose their will and belief system about women’s bodies on society at large.